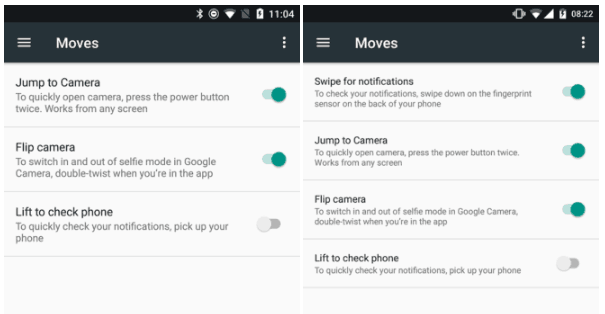 Nexus 5X users can now perform fingerprint gestures! In the past this was a feature exclusive to the Google Pixel and Pixel XL users. With this update to the Android OS, Nexus 5X users too, can make use of it. The users need to go to settings and navigate to moves. Over there they would find a ‘swipe for notifications’ option. It allows the users to check for notifications without removing their index finger from the back of the phone. In November, when users of the Nexus 5X and Nexus 6P realized this is a Google Pixel exclusive feature, there was quite a dissatisfaction. With the Android 7.1.2 Nougat OS update, Google has now brought this update for the LG Nexus 5X users too. While the Nexus 6P images are not released yet, we do not know what lies ahead. However it is likely that the update would come to the users of the Huawei Nexus 6P too, as the Google Pixel and the Nexus 6P share the same fingerprint scanner. In the past Google had said that “same hardware doesn’t mean same capabilities, alas.” However, Google was later evaluating the options to bring in the feature to the Nexus users as well. This has finally happened with the Android 7.1.2 Nougat OS update. More updates are likely to follow in the next few days as we know more about the ‘enhancements’ that Google says are here.